I recently switched diaper bags to something a little sturdier, and in the process decided to clean all my mama bags out. I do this. I get one project going and it always turns into this big production. Anyway, I dumped out everything from all my totes and woven baskets with leather handles and backpacks onto the living room floor and began to sort. I tossed about half of the contents, which were mostly wrappers and paper of some kind, and realized I had seven kinds of creams and healing ointments tucked inside various pockets. The ones with in rolled up tubes were practically empty, and the ones with screw off caps were almost full. It’s interesting how much the actual vessel we use for certain products affects our actual use of them! The next day I decided to make more of my own homemade owie cream to keep in my diaper bag for on the go situations, as well as one for our first aid kit at home. After testing a several batches, I can now say that am extremely satisfied with this stuff and think you will be too. The consistency is pretty close to perfect, which can be hard to balance when making your own natural-based products at home. The combination of ingredients used are ones that can help restore and balance skin in many different types of situations. Note: I used a variation of this when Theodore had eczema and we still use it every night to help prevent future breakouts on his sensitive skin. The only difference with this batch is that it is made to work in this roll tube so it’s much easier to apply! What can you use this owie balm for? 10 drops Melrose oil – YL blend made of Melaleuca (Melaleuca alternifolia), naouli (Melaleuca quinquenervia), rosemary (Rosmarinus officinalis), and clove (Syzygium aromatic) used to support healthy skin. 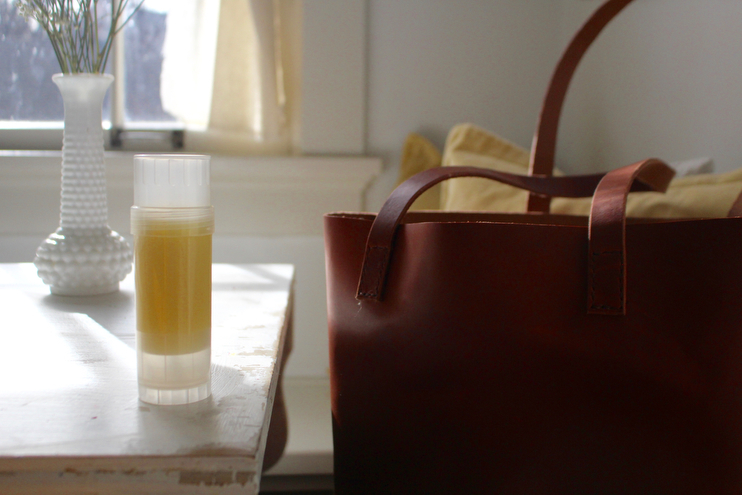 A substitute for Melrose oil would be 5 drops tea tree + 5 drops rosemary 5 drops clove). A sauce pan or old glass pyrex measuring cup you don’t mind ruining. I have one like THIS from Target and use it for all my essential oil concoctions. Old spoon or whisk for stirring. Empty containers. There are a wide variety out there but I settled on THESE and really like them. This process is an easy one. First take your coconut oil, beeswax pellets, and cocoa butter and heat them up. Use an old sauce pan or a glass pyrex cup over simmering water, and heat until the ingredients start to melt together. Stirring helps this process along. Once the beeswax pellets are melted take your pan off the heat and stir in the remaining ingredients. Mix well. Pour into your roll up containers and store somewhere cool overnight. This mixture should harden fairly fast, so if you are really eager to try it out leave it sit for a few hours and you should be all set. You can speed up this process by putting it in the refrigerator. This batch makes roughly 2.5 containers. If you happen to give this a try let me know how you like it! Mom’s with little ones this is a wonderful addition to have for your diaper bag, and a sweet little gift idea to give new moms. 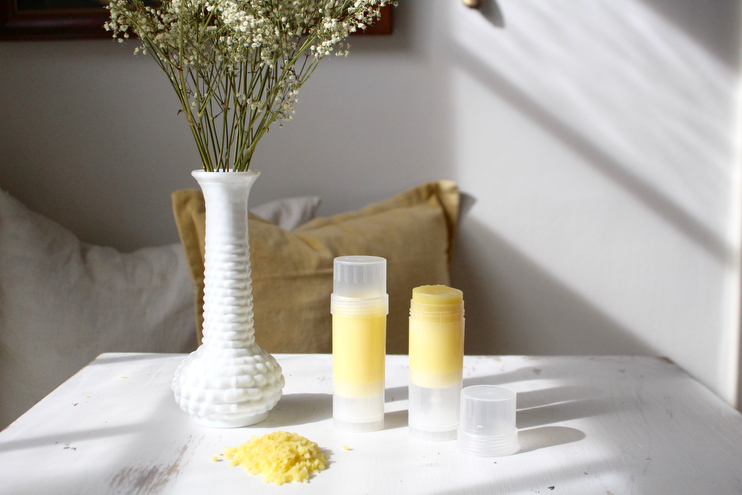 What other homemade all natural beauty products have you always wanted to try? Check my NATURAL & WHOLE series for natural, homemade wellness ideas. Really looking forward to making this! I need to get all the ingredients together first. 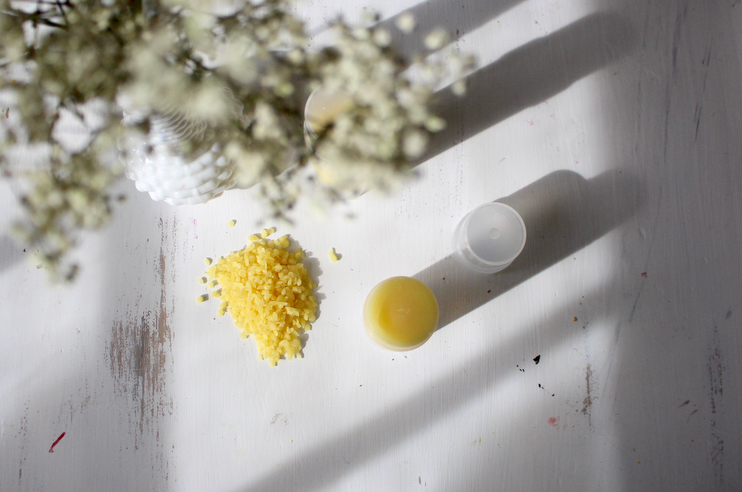 I was wondering if you could link the beeswax pellets,jojoba oil and cocoa butter if you bought them online. I love it when you add the links! Thank you again for taking the time to put together these beautiful posts, with pictures and your inspiring words. thank you! I was wondering if you could specify how you change this recipe for the eczema cream? My little boy is so sensitive and I would love a natural remedy for his skin.